First … this is not a hit piece on Coach Mario Cristobal and his staff, because, as I’ve written before, I love what they are accomplishing on the recruiting front. It is nothing but miraculous following the most recent two seasons and considering Cristobal is the third head coach in as many years. I am a fan like you. Yes, I write and analyze, but in the end, I am more of a fan than a publisher, writer or analyst. I have been excited about the Ducks being No. 2 nationally in recruiting like everyone has, and it has given me a little swagger back as a fan (at least with my Husky-Bruin friends). However, I did a little research, and what I learned would be helpful to pass along to my feathered friends among the Duck faithful so as to prepare you to temper your expectations and to be more accepting of the realities of the recruiting ranking systems and college football biases. Below are the final standings of the 2018 Recruiting Team Rankings, after adding Bryan Addison to the Ducks, who joined us for fall camp and who was formerly the second-best UCLA recruit in 2018. You will note Oregon at No. 13, and I ask you … what is the difference between the Ducks and the other teams in the top ten? Oregon does not have a single five-star player in 2018, (above) and neither does No. 11 or No. 12, which is why all three of us were shut out of the top ten. While the Ducks currently have 15 4-Star players verbally committed for 2019, and you would think that would put us in the top ten at the end of the year, but look at Auburn with 17 4-Star players signed in 2018; they were shut out too! Look at those five-star players above and your jaw will drop seeing Clemson with six, USC with five and Georgia with an unreal eight 5-star players? Holy Crap! 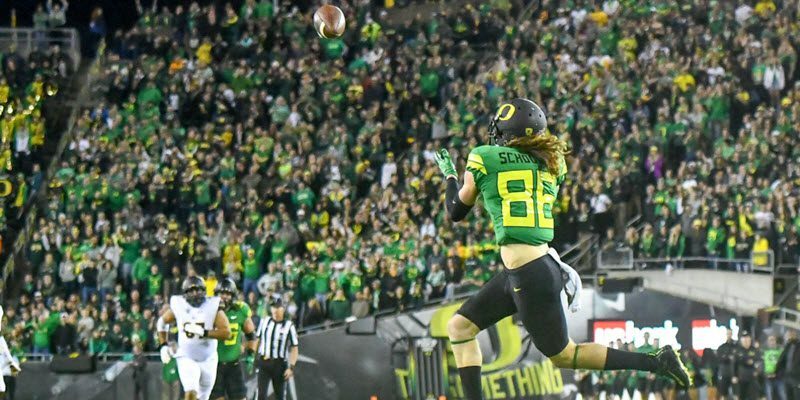 It is evident that my beloved Ducks have a ways to go to get to the recruiting promised land, and that truth is that this is what I needed to see in order to pump the brakes on my hopping-up-and-down exuberance, and get back to earth. You Mean We Have a Chance? Kayvon Thibodeaux is a 5-Star at a position of need for the Ducks. The Ducks do have a chance at landing a 5-Star player for the 2019 class, but it is a thin one. The No. 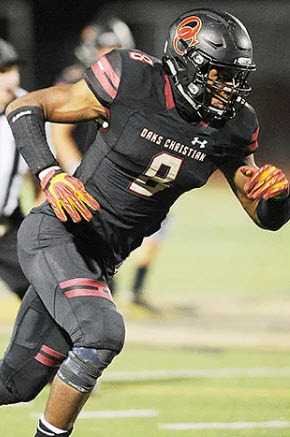 1 prospect in the entire nation, Kayvon Thibodeaux, is a defensive end in California who is very interested in the Ducks. The first objective for the Cristobal staff is getting him to a game this fall for an official visit, since he missed the July Saturday Night Live recruiting event. Finally, we learned from Kevin Wade at 24/7 Duck Territory (another fine subscription site I suggest as well) that Oregon is chasing another 5-Star player in Ishmael Sopsher (Louisiana) who, as a defensive tackle, is at another position of need for Oregon. The Ducks made his final seven schools recently, and he indicated he wanted to visit Eugene. Nonetheless, I see him leaving the SEC (and mama’s cooking) as a low probability. 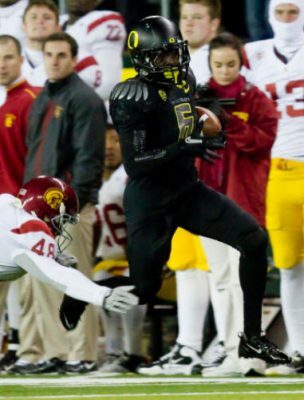 For many fans, watching Oregon gradually slide out of the top ten will seem like a failure. But the truth is, we have no chance of finishing in the top ten without a 5-Star player, and the probabilities of securing one are quite low … at this moment. The right 5-Star player, like a De’Anthony Thomas-type, has to see other recruiting success first. I write that because I am hearing rumblings that some big players, elite players … high four- and five-star type players who are verbally committed to other schools are now listening to Oregon coaches. Why? Because they can see the class being assembled, and elite players want to play with other elite players. They see opportunity for early playing time on a team that, in business parlance, is a fallen angel that is now on a furious comeback. If Oregon should win nine or ten games and show continued improvement in the 2018 season, it might be enough to pull some of the elite recruits away from other big schools. 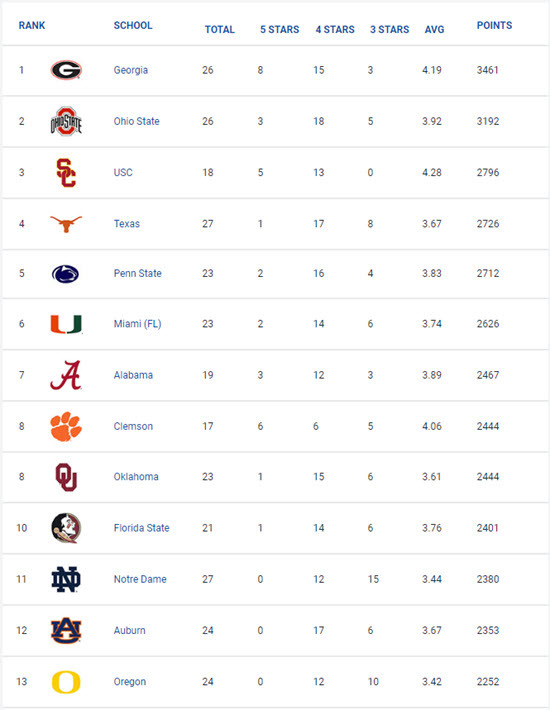 Thus, Oregon fans really won’t know if we break the top ten until signing day in February 2019, as some of these big fish may not disclose their defection until the last minute. The final step in recruiting is attracting the big fish, the 5-Star players, and the Ducks are on that path. That step cannot be achieved until you prove your program is worthy by recruiting an incredible base of talent, and Oregon has done precisely that by beating the two-year recruiting record for most 4- and 5-Star players (27 to 21). Signing the 5-Star players will happen, and it is the natural next step in the recruiting trajectory of the Cristobal staff. The hardest step has been achieved, and I never thought I would see this accomplished over a four-year period, let alone from a one-game-coach so quickly.